At 25 storeys high and a mile long – four times longer than the Queen Mary II – the 2.7 million-ton vessel would be so large that it could never enter a port. Instead, it would circle the globe once every two years, anchoring offshore major cities to allow its residents to enjoy some of the world’s top destinations – or shake off any seasickness. Envisioned to spend approximately 70 per cent of its time moored up and 30 per cent transiting between countries, the Freedom Ship would leave the east coast of the United States in June and cross the Atlantic to Europe. There – to coincide with the summer months – it would loop around the north coast of Scotland to Scandinavia and back through the English Channel before heading down to the Straits of Gibraltar and into the Mediterranean. Christmas would be spent off the north coast of Africa followed by a jaunt down to the Cape of South Africa in January. The vessel would then head across to Australia in time for the latter months of the Antipodean summer before travelling up through Asia and crossing the Pacific to the US west coast in September. Entering the final stretch in its second year, the ocean-faring community would be transported around the Americas, heading to the furthest reaches of Patagonia and Tierra del Fuego before returning to its US starting point via Latin capitals such as Buenos Aires and Rio de Janeiro – and beginning its route all over again. Should residents find themselves yearning for dry land, they can fly to and from the Freedom Ship at any time using the airport on the top deck. And the vessel also offers room for another 30,000 daily visitors and 10,000 overnight guests, as well as 20,000 crew. Roger M Gooch, director and vice-president of Freedom Ship International said he was happy to announce that after a hiatus due to the economic crisis, the seagoing city “now looks as if it is a live project again”. 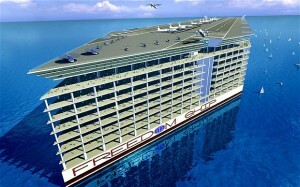 “The Freedom Ship will be the largest vessel ever built, and the first ever floating city,” he said. “This will be a very heavily capitalised project and the global economy in the last few years hasn’t been too inviting for unproven progressive projects like ours,” Mr Gooch explained. The grand mufti of Saudi Arabia said a ban on women driving in the Islamic Gulf state protects society from “evil”, in remarks published in the press on Thursday. Sheikh Abdul Aziz bin Abdullah al-Sheikh, in a speech delivered Wednesday in the western city of Medina, said the issue of giving women the right to drive should not be “one of society’s major concerns”. The kingdom’s most senior Islamic cleric called for “the matter to be considered from the perspective of protecting society from evil” which, according to him, included letting women drive. His comments came as activists said they had been assured by Interior Minister Prince Mohammed bin Nayef that authorities were reassessing the controversial Saudi ban on women drivers. “Rest assured that the issue is being discussed, and expect a good outcome,” the minister was quoted as saying on Wednesday by Aziza al-Yusef, who met him along with fellow activist Hala al-Dosari. The absolute monarchy [Saudi Arabia] is the only country in the world where women are barred from driving, a regulation that has drawn condemnation from the international community. Prince Mohammed stressed that the ban was “a matter to be decided by the legislative authority”, Yusef told AFP. Saudi Arabia has an all-appointed consultative Shura Council, with no elected parliament. The council makes recommendations to the government, but the king remains the absolute legislator. “We expect a royal decree that gives us this right,” Yusef said. At least 16 women were stopped by police during a driving protest day last month, and were fined and forced along with their male guardians to promise to obey the kingdom’s laws. In addition to the driving ban, Saudi women are forced to cover themselves from head to toe and need permission from a male guardian to travel, work and marry. 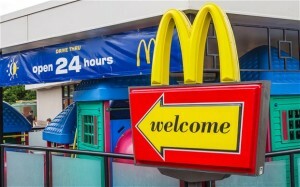 A McDonald’s outlet in Australia has begun playing classical musical and opera late at night to deter young people from loitering around the restaurant. Fed up with their outlet’s nocturnal transformation into an unofficial youth club, the store adopted the tactic a few weeks ago and says it has significantly reduced the number of loiterers, particularly around the car park. The strategy has reportedly been tried before by a local council at a car park in Australia, though previous efforts involved blaring songs by Barry Manilow. Matthew Watson, the operations manager at the Mt Annan McDonald’s on the outskirts of Sydney, said the music had been a successful deterrent. “We’ve noticed a reduction in the number of young people hanging around, but we’ll have to reassess it properly in a couple of weeks,” the store’s operations manager, Matthew Watson, told the Macarthur Chronicle newspaper. The tactic drew a mixed response on social media, with some locals saying the music was played too loud and others saying “it might bring a bit of class to the area”. “They turn it up really loud when youth are hanging around the car park,” wrote Janeen Brady on the local newspaper’s Facebook page. “It woke me up at 1am Tuesday night and it’s only going to get worse as Christmas approaches.” A comment by Erin Cox, said: “I may just stay longer. I have no issue with classical music it’s quite nice.” Another comment, from Stef Awns, noted: “It’s a shame that classical music supposedly has this impact on people”. A book of psalms is expected to break the record for most expensive text ever sold at auction when it is sold today. The Bay Psalm Book will be auctioned at Sotheby’s in New York, where it is expected to fetch up to $30 million. The 300-page volume was printed by puritan settlers in New England around 1640. Its full title is The Whole Booke of Psalmes Faithfully Translated into English Metre. It was previously reported that the book was to be sold by the Old South Church in Boston, as one of the church’s two remaining copies, to fund building repairs and charity work. The church originally owned five copies of the book. 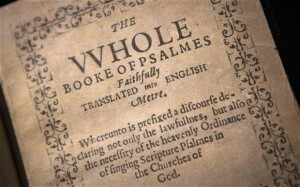 The psalms were printed partly as an act of defiance against the Church of England and the King James Bible. They were given a new translation, attempting to get closer to the original Hebrew than the existing contemporary translations managed. It is thought that originally there were 1,700 copies, but only 11 in total are now known for certain to survive. It is the first book to have been printed in what is now the United States. The previous record for most expensive book sold at auction is The Birds of America by John James Audubon, a 19th-century volume of ornithological illustration, which was bought for $11.7 million in 2010. The Birds of America is over three feet long, a stark contrast to the pocket-sized Bay Psalm Book, which was designed to be portable and easy for churchgoers to use.